I have to wear compression socks every day so comfort is vital. These are comfortable. Doctor suggested these might be helpful. Need leg support and liked the foot being out. I bought these to wear under boots as I do not like to wear bulky socks with tall boot. These socks should add comfort while wearing the boots as well. It would help the circulation in my legs while I work. Compression stockings is prescribed by my Doctor (vascular Specialist) for chronic DVT in right leg. Like the sturip style compression socks. I am an RN and on my feet all day. I use compression stocking because I'm on my feet most days. And I drive a big rig the rest of the time so my ankles swell some times. But with normal compression stockings their too tight on my toes. I choose these because of the stirrup style. There often is too much pressure around a person's toes when using regular, closed in stockings, and they hurt. These do not. I have purchased similar stockings before and need more. Please do not quit selling them. it's summertime and I need compression socks that let my toes breathe. would like to see these in more colors. Trial purchase to check for support, comfort, and durability. I am diabetic and wear flip flops all year round,these are great for that and helps with swelling in legs. My legs are large so hope these will fit. 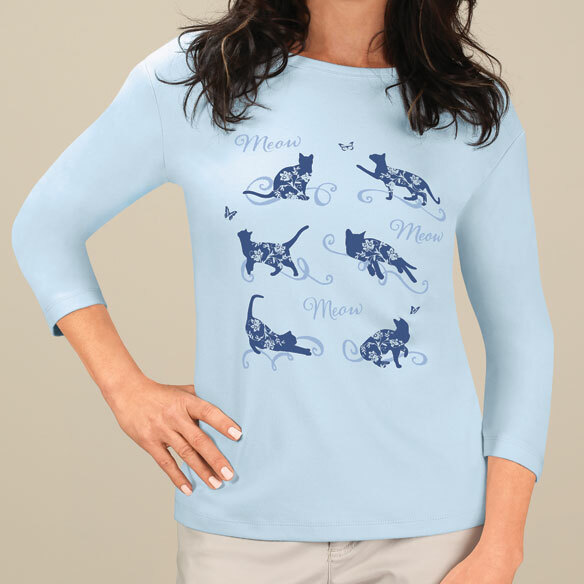 Provides support and style at the same time. 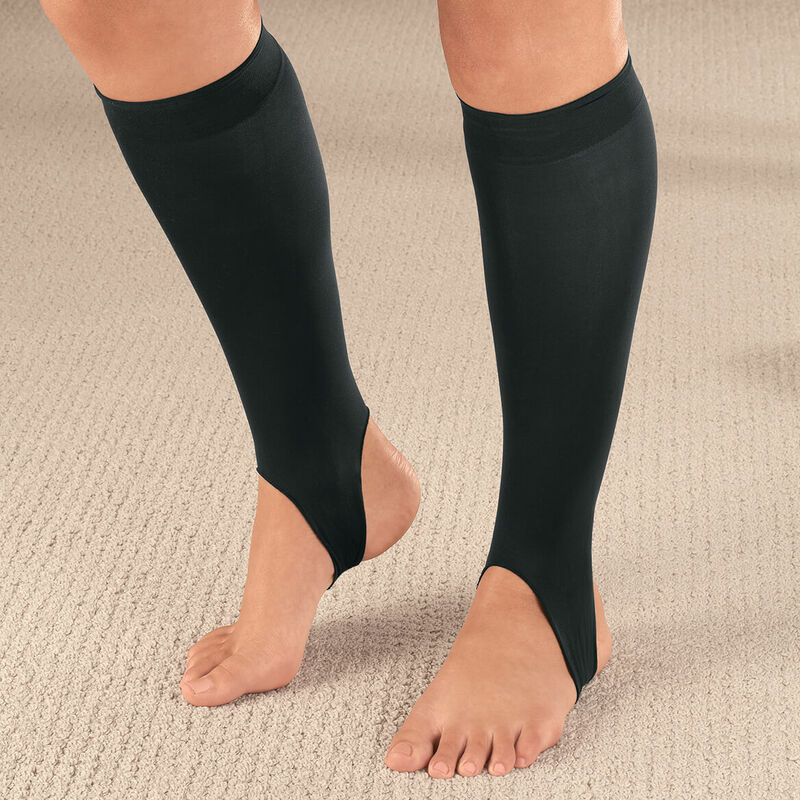 I wear support knee hi hose and like the stirrup part that I can't seem to find anywhere else. 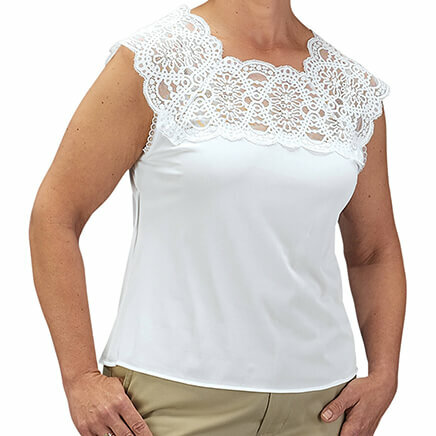 Great to wear with sandals. I just bought a pair from a Medical Supply Store and they were extremely expensive. I would like to learn if these are just as good but with a reasonable price. easier to wear with Sandals and toe or heel does not run. recommended by doctor; just trying them out. chose because the foot is free. just what type of socks I have been looking for. I chose this for my airplane travel. 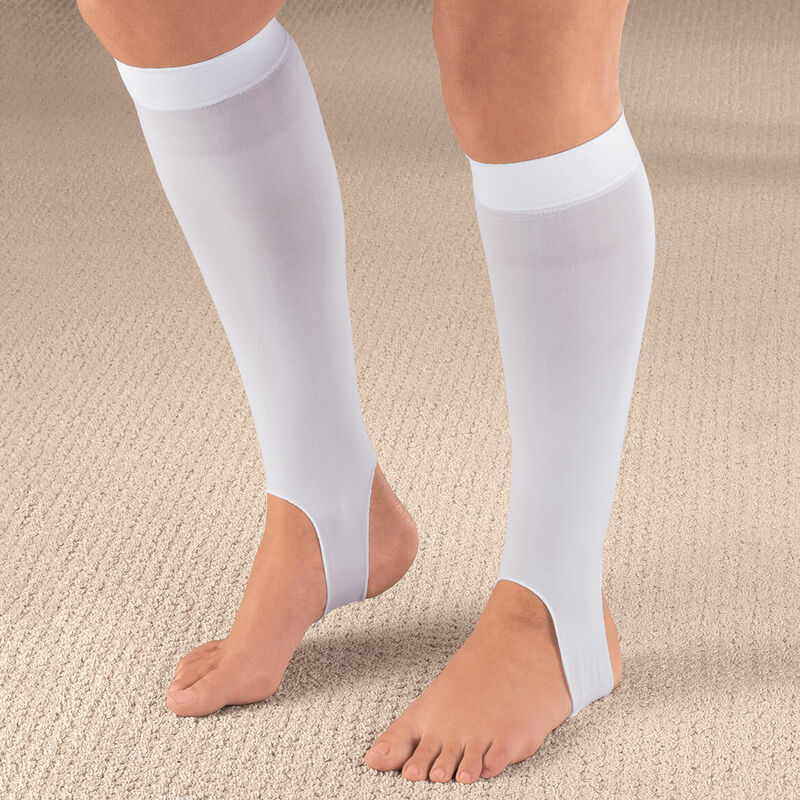 After reading about these knee highs and that there would be no pressure on the feet and they look easy to put on. I like the fact that the heel and toes are out for sandals. Can you wear these at night? BEST ANSWER: Yes, I wear them at night, in fact, that is why I bought them. 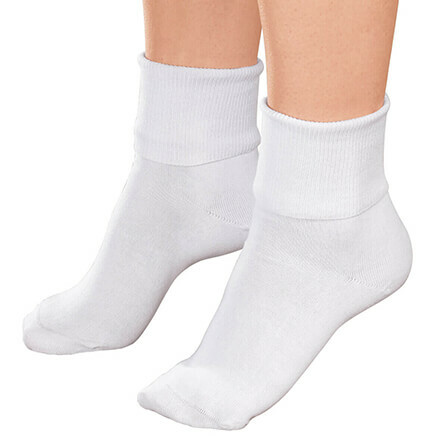 I think they can be worn at night and longer than the conventional socks because they are very light weight and because of the open heal and toe. I have bought the heavier/thicker compression socks for day time use. Yes they could be. The top was a comfortable pressure but the ankle width was too big for my ankles. Otherwise I was going to wear them at night and on the planes. my doctor tells me not to wear them when I retire at night, otherwise they work fine for me during the day,very comfortable. I don't know why not. The compression is not too tight. I have not worn them at night. What level of compression do these offer? Are they 8-15mmHg compression, or more or less? BEST ANSWER: Thank you for your question. 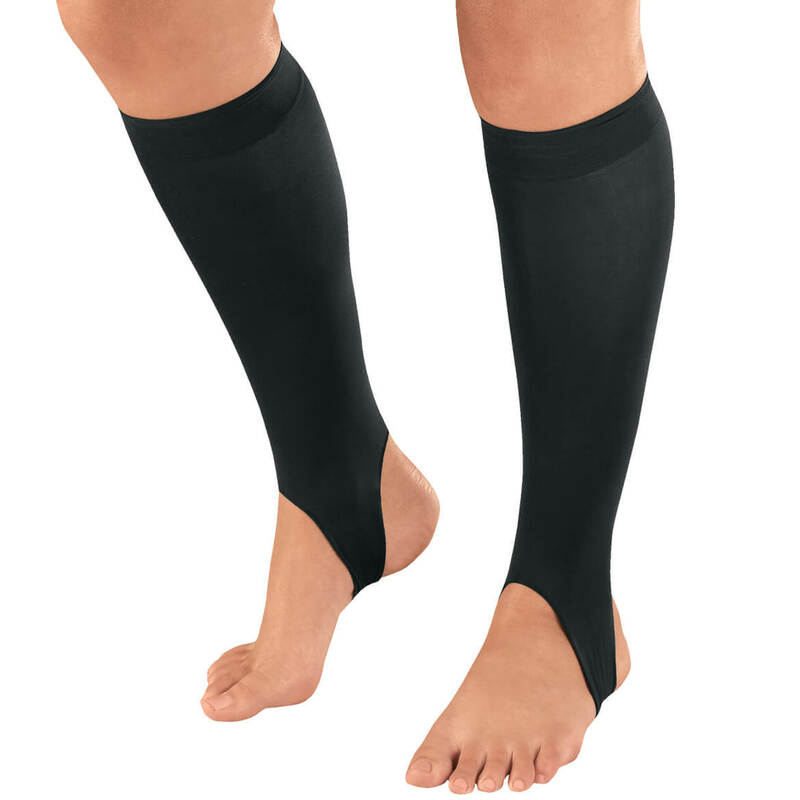 The compression on these are 8-12mmHg.We hope this information will be of help to you.